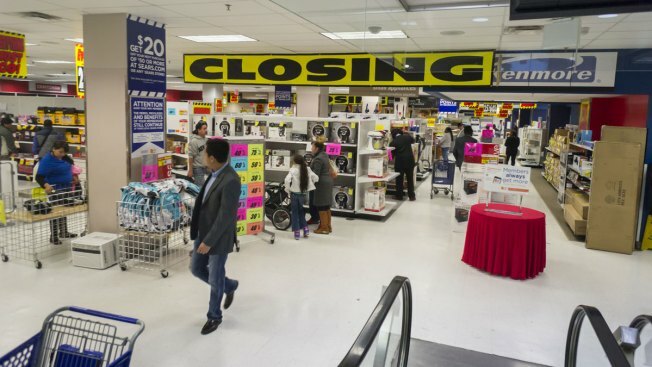 This 2014 file photo shows customers search for bargains at a closing Sears store in the Bronx, New York. Sears' chairman, Eddie Lampert, earlier this month unveiled his $4.6 billion proposal to save Sears by buying the company out of bankruptcy through his hedge fund, ESL Investments. Such a deal is likely its last chance at survival. If Lampert can't buy the company, it will likely need to liquidate and sell itself in parts. But as the deal faces increasing legal and financing challenges, the company is bracing for the reality it may not come together at all. Sears' advisors told the bankruptcy court judge this week the company is already planning to close a number of stores and solicit liquidation bids as a protection, should Lampert's effort fall apart. The retailer is weighing closing to 50 to 80 more stores at the end of the year, people familiar with the situation tell CNBC. That could bring Sears' footprint closer to 400. Lampert has said he wants to buy roughly 500 stores. The plans are a precaution. It is possible that Sears averts further store closures should Lampert seal a deal to buy the company and its 500-store footprint. But they are an implicit acknowledgement of the potential bleak reality that may lie soon in Sears' future. Lampert has yet to formalize and submit financing to support his offer for Sears, people familiar with the situation tell CNBC. Advisers spent much of Monday in active negotiations discussing the asset-backed loan that would support Lampert's offer. Lending to Sears provides bank underwriting fees, but it also would require confidence in the business strategy of a company that hasn't turned a profit since 2010. Some of Sears' creditors have taken aim at some Sears' transactions under Lampert's leadership, including his spinoff of Lands' End and transactions with Seritage Growth Properties, the real estate investment trust Lampert created through select Sears properties. Those creditors told the bankruptcy court judge this week they plan to contest a credit bid. In a statement provided to CNBC, a spokesperson for ESL Investments said, "ESL Investments is working around the clock to try to keep Sears in business with a going concern proposal that would save tens of thousands of jobs and provide severance protections for eligible workers."